Hendersonville, a long-time leader in apple production, now leads the way in hard cider. Henderson County is the top apple-producing county in North Carolina and seventh largest in the nation. Its abundance of orchards makes the area a natural home for the hard cider industry, and all of the cideries source apples locally. Two craft cideries currently call Henderson County home, including Bold Rock Hard Cider, which is the largest craft cidery in the United States. 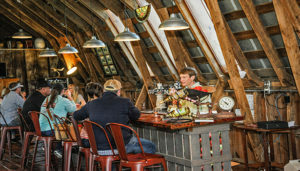 Bold Rock Hard Cider, founded in Virginia, operates its second production facility, along with a state-of-the-art tasting room, just outside Hendersonville in Mills River. Production at the Mills River cidery has grown substantially and will exceed that of the original location in Virginia by the end of 2018. 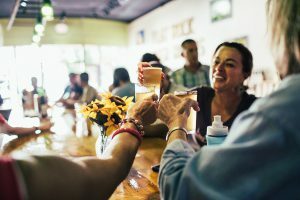 Bold Rock’s Mills River taproom now includes a cider garden, outdoor music venue and on-site food truck that serves barbecue and other Southern fare. Appalachian Ridge Artisan Cider, makes excellent European-style ciders from a restored barn in the middle of an apple orchard. Appalachian Ridge Artisan Cider offers his line of dry ciders, as well as pommeau, a spirit that is made by mixing apple cider and brandy. The two cideries are part of the Hendersonville Cheers! Trail, which includes six breweries and two wineries. Click to download a Cheers! Trail brochure and map.